As a designer, I’m always preaching the importance of the use of the right imagery and the decisions made for appropriate logotypes as an instant visual language to convey what music is held within the LP jacket or CD jewel case – and the subsequent reduction in the importance, or even need, or physical artwork is something else to lament in the digital age. I have often bought albums on the strength of the cover, and see nothing wrong with that. 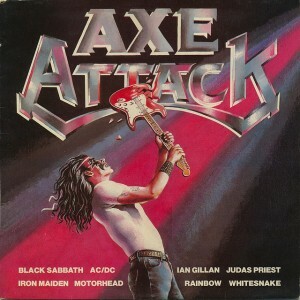 The logo design used for “Axe Attack” alone tells you that it’s a heavy metal album, and one I’d no doubt took time to copy into my sketchbooks and school diary. Likewise, the lone, long haired “axeman”, swinging his Stratocaster style “axe” into the logo instantly confirms that this is definitely a “rock” album, a “heavy rock” album, a “heavy metal” albums – which is certainly how you would have described the bands within (Whitesnake, Girlschool, UFO) at the time. So if I don’t feel any great nostalgic kinship with KISS, Van Halen or a host of other contemporaneous bands, blame K-Tel records for never including them on “Axe Attack”.